I love love love pizza – both homemade and restaurant-made. Pizza is on our menu at least once a week, whether it’s homemade, take-out, dine-out, or even (gasp!) the occasional frozen pizza. No shame in enjoying one of those every now and then, am I right? =) Making homemade pizzas is one of my favorite family dinner ideas, as you can customize them so there’s something appealing for everyone in the household. I tend to make something fairly traditional for my husband + Fearless Baby, as they like cheese, pepperoni, sausage or meatball pizzas the best, and then something more veggie-heavy for myself, like this awesome Arugula, Caramelized Onion and Goat Cheese Pizza. This pizza is divine – truly, one of the tastiest flavor combinations I’ve had on a vegetarian pizza. 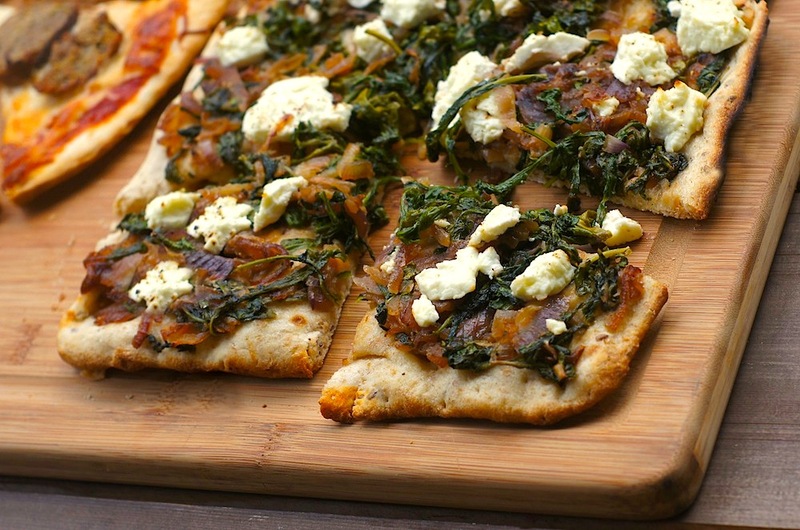 Creamy, rich goat cheese, sweet caramelized onion, + peppery arugula on a crisp, flavorful multigrain flatbread crust. While I usually make my own pizza dough (from this recipe – the most popular recipe on my blog! ), this particular pizza is one that I actually *prefer* with a store-bought multigrain flatbread crust (this Stonefire one is my favorite! ), as the flavor + texture combination between the crust and the toppings is simply perfect. So, next time you’re looking for an amazingly delicious, meat-free, quick-to-make pizza, give this awesome recipe a try! Put the oil and onions in a medium skillet and cook over very low heat, stirring occasionally, until onions are soft and caramelized, about 15 minutes. Turn the heat up to medium and add the arugula. Cook until the arugula is wilted, about 1 minute. Season to taste with salt and pepper. Spread the onion/arugula mixture over the crust, and top with generous, evenly-spaced crumbles of the goat cheese. Place the pizza on the middle rack of the preheated oven and bake for 10-12 minutes, until the crust is heated through and the cheese is starting to soften + brown. Remove from the oven, allow to cool for a minute or two, then cut into 8 slices and serve warm. This pizza looks dang delicious. I love it! This looks like the two kinds of pizza in my household One with lots of veggies and the other with just meat and cheese. We made pizza last night and my husband attempted his first “stuffed crust”…turned out pretty well! I have never used caramelized onions on pizza but that sounds amazing! I could do with a few slices of this incredibly delicious pizza right away!! These certainly are wonderful flavor combinations. I love pizza, and I’m with you about there being nothing wrong with enjoying a frozen one now and again. They are quick and satisfying. What could possibly be wrong with that? Oooooooo I swear pizza is my favorite food ever. I would have pizza as my last meal, so I am SO trying these! PS I’m so glad I found your blog!! Pizza is fantastic, isn’t it? =) So glad you found my blog, too! I’d love this pizza – it truly uses all my favourite flavours! 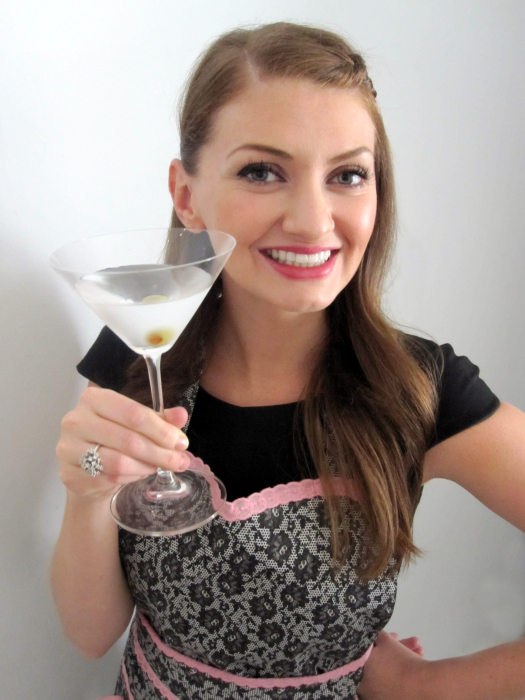 Thanks for the recipe, Amy! This is the type of pizza that my husband and I both like…it looks delicious. This pizza looks terrific! I don’t think I’ve used arugula on pizza before, so that’s a new topping for me. We also have pizza about once a week and love coming up with new topping combinations. It’s such a fun and versatile meal. ohh.h… i adore pizza! Looks delicious! omg! I love your home made pizza crust! It looks scrumptious! Oooh this looks fabulous! 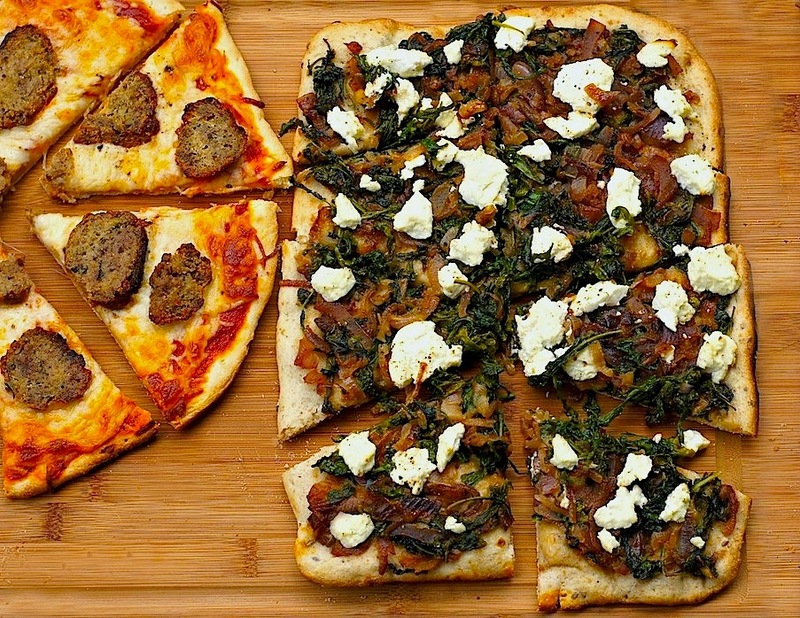 We love pizza and the arugula and caramelized onions sound amazing!!! I can’t wait to try this next time we have pizza night! Yum! Hey, I know this pizza! I’ve had it many times. I prefer it with goat cheese, but feta will work, too! All of my favorites in one pizza! Looks amazing!